It is important to focus on right strategies to develop your sales team. High performance sales team is essential for any Business. All the sales people should know about their roles and responsibilities. To be successful they need resources, effective sales leadership, Training and sales process management systems. You should recruit people who are highly motivated to get success. When organization select right people and train them well they not only give better results but also stay with the organization for long time. Hiring right people will definitely increase your company’s profits. It is the direct reflection of your business. Do sales meetings with your team and help them to improve where their efforts are lacking. Sales team is the main resource of each company. Give opportunity to each team member to grow. Communicate with your team about business goals. They can’t perform well when they are not confident about doing tasks. Encourage them with rewards. Training helps your team to perform well. Without product knowledge your sales people can’t do sales. Training plays an important role in the development of the team. When your team is confident about the product knowledge they can better understand the customer needs. Teach them how to handle customers and solve their issues. Removing repetitive manual tasks provide your team useful tool. SalesBabu CRM Software is cloud based application which helps organizations to track sales force activities and streamlines the sales process. In a click they can access their daily tasks and maintain customer details. With the help of this software they can easily make a list of potential clients. Sales people are revenue generators; they only need correct guidance and sales tools. Set challenging but achievable goals for them. Team building helps you to reach goals. Track the progress of goals. Goals give clarity about everyone’s responsibilities and roles. 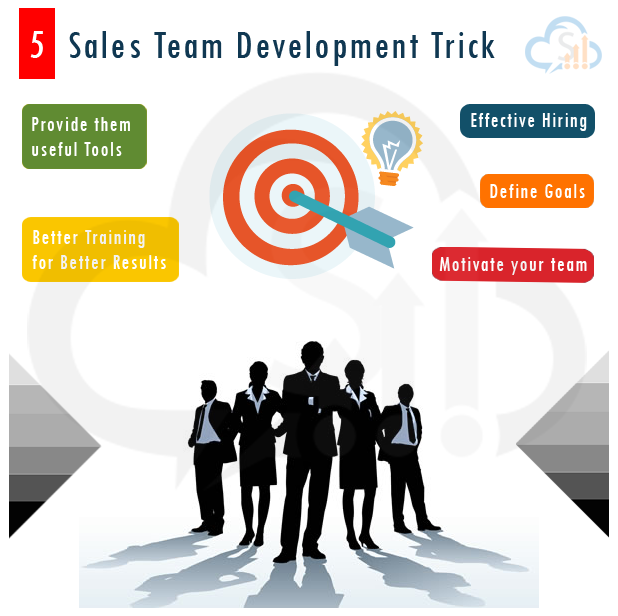 The post Five Sales Team Development Tricks appeared first on SalesBabu Business Solutions Pvt. Ltd..